The Mojave Desert is located between the Great Basin Desert to the north and the Sonoran to the south (mainly between 34 and 38°N latitudes). The Mojave is a rainshadow desert, defined by a combination of latitude, elevation, geology, and indicator plants. Although the Mojave Desert has the lowest absolute elevation and the highest maximum temperature (134°F in Death Valley), it is north of the Sonoran Desert and its average elevations are higher. As a result, its average temperatures are lower than those of the Sonoran. The Mojave is in what some geographers call the Basin and Range Province, a landscape of alternating mountain ranges and their adjacent basins. Common rock substrates include Precambrian gneisses and granites. Slopes are often composed of metamorphic rocks, such as gneisses. Mojave Desert vegetation is dominated by low, widely spaced shrubs. Vegetation in the deserts northern half closely resembles that of the Great Basin Desert, as that in the southern half does the Sonoran. However, nearly one quarter of all Mojave Desert plants are endemics. 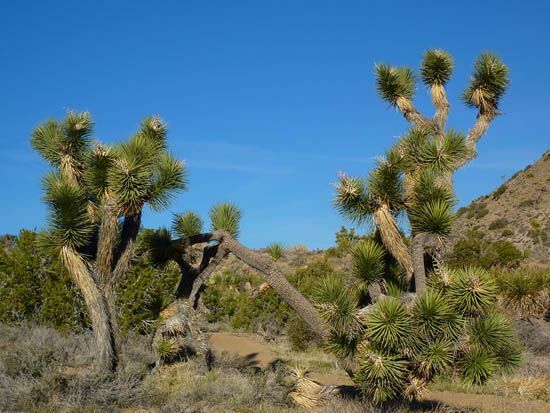 Joshua Tree National Park is renowned for its biological diversity, with 813 species of vascular plants.